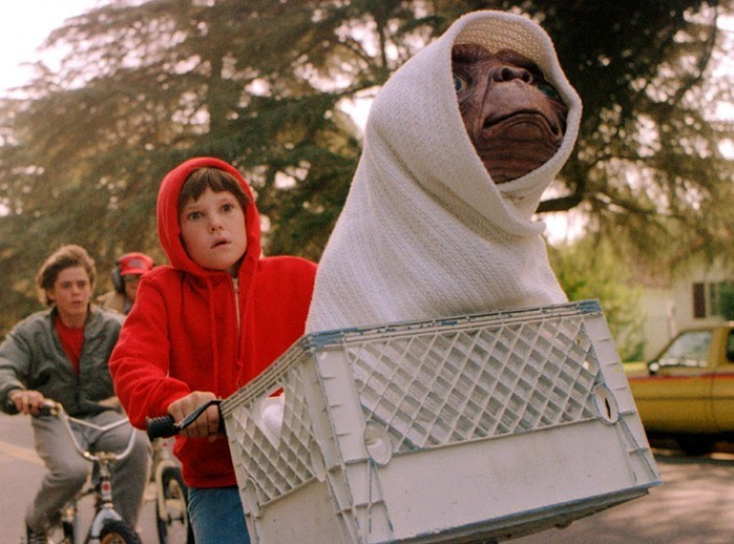 ‘E.T.’ Returns in New 35th Anniversary Limited Edition … plus an ‘E.T.’ giveaway!!! E.T. THE EXTRA-TERRESTRIAL 35TH ANNIVERSARY EDITION BLU-RAY DVD. (DVD Artwork). ©Universal Studions. HOLLYWOOD—This year marks the 35th anniversary of the release of director Steven Spielberg’s iconic sci-fi classic “E.T. The Extra-Terrestrial,” the unforgettable and emotional adventure of an adorable alien lost on Earth and the lonely boy who befriends him. Winner of four Academy Awards, including Best Music/Original Score for composer John Williams, “E.T. The Extra-Terrestrial” has become a cinematic touchstone for generations of moviegoers and one of the most beloved films of all time. Now, Universal Pictures Home Entertainment celebrates the film’s original theatrical release with a special gift set, “E.T. The Extra-Terrestrial 35th Anniversary Limited Edition” on 4K Ultra HD + Blu-ray + Digital. This special gift set features premium packaging, includes a re-mastered CD soundtrack of the original Grammy Award-winning album, is packed with over three hours of bonus features and includes a collector’s booklet with behind-the-scenes stories and rare images from the archives. “E.T. The Extra-Terrestrial 35th Anniversary Limited Edition” retains all the excitement, drama and warm-hearted humor that made it an instant worldwide classic. Fans can also relive the adventure and magic of one of the most beloved motion pictures of all-time, with the 4K Ultra HD Combo Pack along with the new Blu-ray Combo Pack and DVD editions that showcase new artwork of the beloved cast. All releases include a code to redeem the film on digital plus over three hours of bonus features. The bonus features on the Blu-ray and DVD including “The E.T. Journals,” where viewers can retrace the day-to-day experience of creating E.T from behind-the-scenes footage shot by Academy Award-winning cinematographer John Toll; “Steven Spielberg & E.T.,” in which viewers can watch an interview with Steven Spielberg, as he reflects back on the film and discusses his experience working with the actors, as well as his overall and current perspective on E.T; “The Music of E.T. 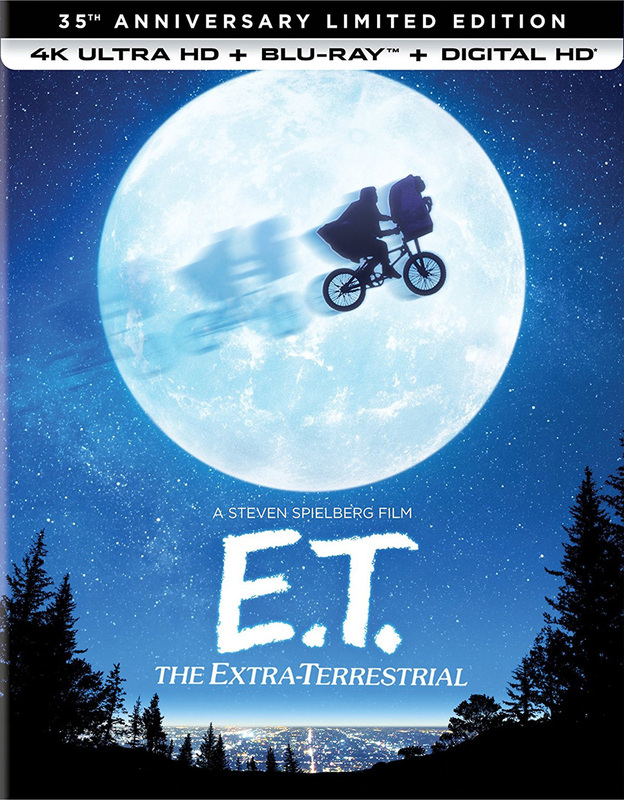 : A Discussion with John Williams,” showing interviews and footage focused on the long-standing relationship between the Oscar-winning composer and director Spielberg; “Designs, Photographs and Marketing of E.T.,” showing E.T. designs by production illustrator Ed Verreaux, E.T. designs by Carlo Rambaldi, the spaceship designs by Ralph McQuarrie and designs by Verreaux; production photographs; “Marketing E.T. A Look Back,” offering a special insider’s look into the making of “E.T.,” featuring interviews with Spielberg, the cast, and others intimately involved with the film; “The E.T. Reunion,” where the cast and filmmaker reunite to discuss their thoughts on the impact of the film; “The 20th Anniversary Premiere,” a behind-the-scenes look at the composer Williams conducting the score of E.T. live at the Shrine Auditorium for the re-release premiere of “E.T.”; deleted scenes and the theatrical trailer. Join 10-year-old Elliot (Henry Thomas), his kid sister Gertie (Drew Barrymore) and older brother Michael (Robert MacNaughton) as they come together to help stranded alien E.T. find his way home. For those who want to see “E.T. The Extra-Terrestrial” in its full big-screen glory, the film returns to theaters nationwide for a two-day cinema event on Sunday, Sept. 17, and Wednesday, Sept. 20. These special event screenings will feature an exclusive commentary from TCM Primetime Host Ben Mankiewicz. Tickets and participating theaters are available at www.FathomEvents.com. Front Row Features is giving away something fans of all ages can enjoy—a copy of Universal Pictures’ “E.T. : The Extra-Terrestrial 35th Anniversary Limited Edition” in a Blu-ray Combo Pack (Blu-ray, DVD and Digital HD), with more than three hours of bonus features. To enter the contest, simply email frontrowfeatures@gmail.com by Friday, Sept. 24, 2017 with your favorite moment from “E.T. : The Extra-Terrestrial,” along with your name and mailing address. Good luck! Next PostPhotos: ‘E.T.’ Redux in New 35th Anniversary Limited Edition … plus an ‘E.T.’ giveaway!! !